Children and families at Wu Kai Sha Kindergarten are able to access the award-winning ‘Espresso’ service at home. We use Espresso in school to help motivate, engage and support learning in the classroom. Now children from Wu Kai Sha Kindergarten can continue to enjoy what they have been doing at school, and you can be involved in your child’s learning at home. Espresso is an online learning resource that provides a wide range of materials. It contains thousands of videos and multimedia activities, as well as a weekly news service — all designed by teaching professionals. Espresso includes a Home learning area and Parents’ guide with information to help you use the service. To access Espresso from home please Espresso link below. You will need to login using the details provided by the school which can be found in your child’s Communication Book or by contacting the school office. Once logged in to Espresso, please choose the ‘Foundation’ section for the most relevant learning materials for 3-5 year olds. Before you start using Espresso, read the Parents’ guide. This explains what Espresso is, how to use it and how to support your child with their learning. To find the guide, select the Home learning icon (foundation stage) on the left-hand side of the home page. The Parents’ guide button is located in the top left-hand corner of the following page. Your child’s teacher has already begun using Espresso in the classroom. Once you are familiar with the service, you and your child may like to explore Espresso’s modules or the Home learning area. Specifically designed for home use, it includes easy-to-follow Learning paths and curriculum objectives. * Please note that although you have access to all materials on the website, the most relevant learning materials for 3-5 year old children can be found in the ‘Foundation’ sections. 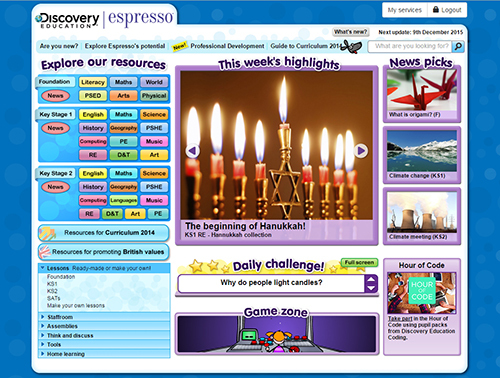 We hope you will find Espresso useful as a resource to extend your child’s learning. If you have any further questions about how to use the service, please speak to your child’s class teacher.